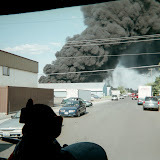 NARRATIVE: On Tuesday, April 3, 2007 at 7:19:44 PM, 8 Companies of Spokane Firefighters, 1 heavy rescue, 1 senior ladder, 5 Engines and 1 Battalion Chief, under the direction of Battalion Chief Steve Sabo responded to a structure fire at 1625 East Pacific Avenue. The first company was on-scene in less than two minutes and immediately encountered a 1-story triplex apartment building heavily involved with smoke and fire in apartment 'A'. Using handlines, Firefighters were able to access the burning structure and begin to aggressively attack the fire. Search and rescue efforts were commenced immediately, evacuating safely from the structure several residents from adjoining apartments. Under fire conditions Ladder 1's search team located an unconscious resident in the rear apartment A. The victim was immediately removed to the exterior where waiting SFD Paramedics immediately began life saving measures. The patient, Karen Eutsler, was transported to Deaconess Medical Center where she succumbed to her injuries and died this evening. The quick action and front-loaded response from SFD was a large contributing factor in the remaining occupants successful exit without injury. Firefighters confined the fire to the structure of origin, fully extinguishing the flames in just 20 minutes. No firefighters or other civilians were injured in this incident. PROBABLE CAUSE: The cause of this incident is under investigation by the Spokane Fire Department. At the time of this release, investigators are still on-scene conducting interviews and examining physical evidence. DAMAGE EXTENT: As a result of the initial company's firefighting efforts, the remaining two apartments were undamaged and are able to reoccupy tonight. Apartment 'A' is uninhabitable and sustained significant structural damage.